Autoimmune diseases diagnoses are often given with no recommended treatments. But food can play a role in helping the body heal. What might an autoimmune disease diet look like? And what foods should you eat and avoid to feel better and even reverse illness? Get answers and hope in this article. If you or someone you know has an autoimmune disease, you know these illnesses can be overwhelming, frustrating, and debilitating. When you have an autoimmune disease, basically, your body is attacking itself. These conditions are notoriously difficult to diagnose. And they can manifest through a wide variety of symptoms. So getting to the root cause isn’t easy and can take a long time. Autoimmune diseases are on the rise in a significant way. Worldwide, up to 700 million people are estimated to be suffering from autoimmune disorders right now. And in the U.S., autoimmune diseases are the third most common category of illness, after cancer and heart disease. About 78% of autoimmune disease cases take place in women. But as the science is showing, food can play a role in helping sufferers of autoimmune disease feel better and heal their bodies. When you have an autoimmune disease, your immune system misidentifies healthy tissues and organs as being foreign. This causes the body to produce antibodies that attack your body’s own tissues. Your symptoms might come on quickly or gradually. You may feel overwhelming fatigue, crippling pain, and debilitating weakness. Or you may feel dizzy and have brain fog. You may feel miserable, like you’re on a roller coaster of good days and bad days with no end in sight. These diseases can be frustrating and isolating, but each experience is unique. All autoimmune diseases share one common theme: an out-of-sync immune system that has turned inward, attacking parts of the body as if they were foreign invaders. In fact, autoimmune diseases can show up in at least 80 different ways in all areas of the body. But all autoimmune diseases share one common theme: an out-of-sync immune system that has turned inward, attacking parts of the body as if they were foreign invaders. Your immune system is crucially important, serving the purpose of protecting your body from infections and bacteria. But when its functions are out of balance, your immune system can become dangerous. Rheumatoid arthritis (RA), chronic inflammation of the joints that leads to pain, swelling, and stiffness. Lupus (SLE), a systemic issue that affects the skin, joints, kidneys, brain, and other organs and can manifest in fatigue, joint pain, fever, and a rash. Celiac sprue disease, a reaction to gluten in which the small intestine becomes inflamed, causing damage and leading to the malabsorption of some nutrients. Pernicious anemia, a condition where the body can’t absorb enough vitamin B-12 in order to make the necessary number of red blood cells. Vitiligo, a condition in which the skin loses its melanocytes (pigment cells), leading to discolored patches on different parts of the body. Scleroderma, a disease in which the connective tissues become tight and stiff. Psoriasis, an issue where skin cells build up to become red, itchy scales. Inflammatory Bowel Diseases, a group of disorders that cause inflammation of the digestion tract. These include Crohn’s disease and Ulcerative colitis. Hashimoto’s disease, a condition in which the thyroid gland is attacked and gradually destroyed, often manifesting in fatigue and weight gain. Addison’s disease, when the adrenal glands don’t produce enough hormones. Symptoms include fatigue, nausea, and weight loss. Graves’ disease, in which the thyroid overproduces hormones. It can manifest in anxiety, tremors, and puffy eyes. Sjögren’s syndrome, a condition which causes dryness of the eyes and mouth and can often accompany other autoimmune diseases. Type 1 diabetes, a condition where the pancreas does not create enough insulin. Patients have to monitor their blood sugar levels for life. n recent history, Westernized countries have seen significantly higher rates of these diseases — suggesting that autoimmune diseases are not just a product of genetics or bad luck. Instead, they may be strongly influenced by the choices we make. Lifestyle changes, particularly food choices, can play a key role in managing or even reversing many of these autoimmune diseases. No established cures for autoimmune diseases exist. 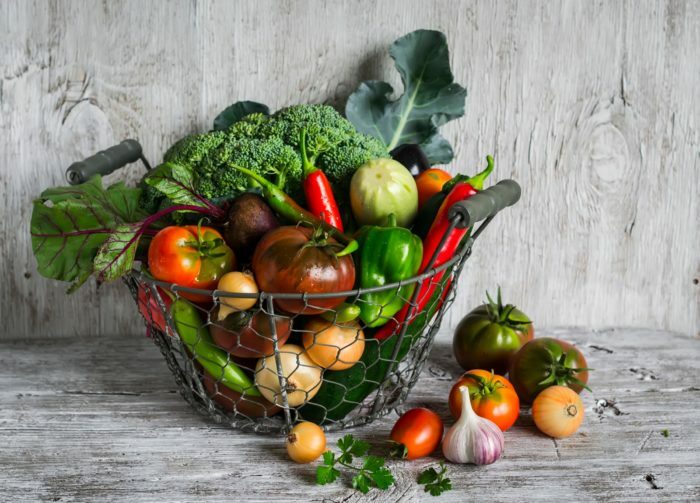 But numerous studies have demonstrated that lifestyle changes, particularly food choices, can play a key role in managing or even reversing many of these autoimmune diseases. Fundamentally, autoimmune disease is an inflammation issue. Doctors typically turn to medication for dealing with the symptoms of inflammatory conditions, which often fails to address the root causes — including allergens, infections, environmental toxins, an inflammatory diet, and stress. But food can be a powerful tool for fighting excessive inflammation. Every autoimmune disease is different. Yet science is pointing to the power of plants to help alleviate symptoms and heal the body. A 2014 research review published in the journal Current Allergy and Asthma Reports found that the symptoms of many autoimmune diseases — including fatigue in MS, pain and diarrhea in IBD, or the need of insulin in type one diabetes — may be “considerably affected” by food choices. A whole food, plant-based diet, in particular, can make a world of difference. A 2001 study published in the journal Rheumatology found that a vegan diet (also free from gluten) could significantly improve the signs and symptoms of rheumatoid arthritis (RA). One potential driver of RA is low levels of potassium. Multiple studies — including this one in the Annals of the Rheumatic Disease — have noted that patients with RA tend to have lower levels of potassium in their blood. Another study published in 2008 in the Journal of Pain found that increasing potassium intake could decrease pain levels in RA patients. Further research has suggested that may apply to other autoimmune conditions as well. Where does potassium come from? The leading sources are plant foods, such as avocado, acorn squash, spinach, sweet potato, pomegranate, and bananas. Another study published in 2008 in the Journal of the Academy of Nutrition and Dietetics concluded that a vegetable-rich plant-based diet increased the levels of many specific nutrients that contribute to a healthy and balanced immune response — including fiber, total vitamin A activity, beta-carotene, vitamins K and C, folate, magnesium, and potassium — all of which contribute to a healthy and balanced immune response. Gut health is a crucial component when it comes to healing, and preventing, the development of autoimmune diseases. Another report published in 2012 in the journal Nature found that when the digestive system encounters saturated fat, it breaks down the healthy bacteria in the gut. This causes inflammation, an increased immune response, and tissue damage. Saturated fat is primarily found in butter, cheese, red meat, and other animal-based foods. So what’s the best way to take care of your gut? Healthy probiotics (beneficial bacteria) can be helpful. Good sources may include fermented foods, such as kimchi and sauerkraut, unsweetened yogurts, coconut kefir, and probiotic supplements. But it’s equally important to feed the “good guys” abundant healthy prebiotic foods that help them to increase. The number one food that probiotics love is fiber. The particular kinds of fiber that are most beneficial are found in chicory root, Jerusalem artichoke, dandelion greens, garlic, leek, onion, asparagus, jicama, apple, flaxseed, and burdock root. 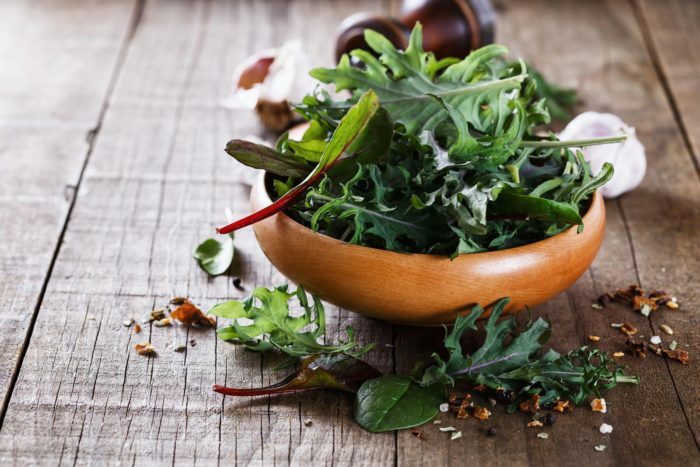 These calcium-rich nutritional powerhouses include kale, mustard greens, collard greens, cabbage, and broccoli. They’re packed with good-for-you vitamins and minerals and can easily be added to smoothies, salads, or stir-fries. Fungi have demonstrated some tremendous anti-inflammatory potential. One 2005 study published in Mediators of Inflammation found that mushrooms can promote anticancer activity, the suppression of autoimmune diseases, and aid in allergy relief. These flavorful veggies have long been touted for their beneficial effects. They contain quercetin, an antioxidant which has been shown to inhibit inflammation-causing leukotrienes, prostaglandins and histamines in both osteoarthritis (OA) and rheumatoid arthritis (RA). The squash family, which includes a colorful array of options like butternut, zucchini, and pumpkin, are winners when it comes to anti-inflammatory efforts. They contain fatty acids (like omega 3s), and antioxidants, including zeaxanthin, lutein, and beta-carotene. These root vegetables are packed with positive ingredients, including an array of antioxidants, such as glucosinolates and carotenoids. They also offer vitamin C, potassium, magnesium, zinc, iron, and more. Certain spices are particularly beneficial when it comes to minimizing inflammation and boosting your body’s healthy immune response. Super-flavorful options include ginger, cayenne pepper, cloves, garlic, cinnamon, and turmeric. Turmeric, in particular, is a powerful anti-inflammatory. A 2007 study published in Advances in Experimental Medicine and Biology noted that curcumin (the primary active ingredient in turmeric) has been shown to help with multiple sclerosis, rheumatoid arthritis, psoriasis, and inflammatory bowel disease. The key ingredient in many starchy comfort foods, gluten can be particularly challenging for those with autoimmune diseases. For anyone with celiac disease, steering clear of gluten is essential. But many people struggling with autoimmune disease may be gluten sensitive. Many people struggling with autoimmune disease may be gluten sensitive. If you are experiencing a difficult-to-solve health challenge, you may want to give up gluten for three to six months to see if you notice any dramatic health improvements. Gluten is found in wheat, spelt, rye, and barley. For some people, gluten may contribute to leaky gut-related challenges. And according to 2014 research published in Best Practice & Research: Clinical Gastroenterology, it may exacerbate conditions like multiple sclerosis, asthma, and RA by increasing inflammation. A Standard American Diet tends to be high in sugar. And those with autoimmune conditions are particularly susceptible to the negative effects of this sweet substance. A 2015 study published in Frontiers of Immunology found that sugar intake increased the likelihood of developing type one diabetes in children at genetic risk. Additionally, according to 1973 research published in The American Journal of Clinical Nutrition, sugars in all forms (glucose, fructose, and sucrose) can impair immune system function, hurting the ability of white blood cells to do battle against threats. It’s best to minimize sugar consumption and to try to keep sugar at around five percent of your dietary makeup. Many animal-based proteins, like those found in meat, milk, and eggs, can cause an inflammatory response in the body, exacerbating autoimmune conditions. A 2010 study reported in the Journal of the American Dietetic Association found that patients who adhered to a vegan diet for three and a half months experienced a great deal of improvement in pain, swollen/tender joints, and morning stiffness than the control group patients who followed a standard American diet. A 2015 study published in Complementary Therapies in Medicine determined that patients who ate a vegan diet for three weeks significantly reduced their C-reactive protein, a significant factor in acute inflammation. Twenty years ago, scientists published research in the American Journal of Cardiology showing that a single meal high in animal fats could cause an immediate spike in inflammation that peaked at around four hours. Essentially, these animal fats paralyzed the arteries, cutting their flow volume almost in half. For those who eat animal products at every meal, just as the inflammation from one meal is winding down — the spike could be starting again. Other studies have found that exposure to animal products can trigger autoimmune attacks and flare-ups in people with conditions like arthritis, so a plant-based diet may be of real benefit. Autoimmune diseases can be notoriously frustrating. But food can be a powerful tool in fighting back against illness and helping your body heal. By sticking to a healthy diet based around whole plant foods and by avoiding some of the key triggers, you can make a world of difference to support your own well-being. And you can boost and balance your immune system so it can be your reliable friend and protector for years and decades to come. Thanks and sorry, but I don’t know how to help you get listed in Yahoo News. Thanks for your inquiry, but we don’t have any apprenticeships available or the ability to subscribe, which we should probably work on at sometime in the future. Hello, Neat post. There’s an issue along with your site when using Internet Explorer. I would check this IE problem out, as the market chief and a big component of people will pass over your excellent writing because of this problem. Woah! I’m really loving the template/theme of this website. It’s simple, yet effective. A lot of times it’s very hard to get that “perfect balance” between usability and visual appearance. I must say you’ve done a fantastic job with this. In addition, the blog loads super fast for me on Firefox. Outstanding Blog! You made some nice points in this article. I did a search on the subject matter and found most agree with this blog. Almost all of the things you mentioned, happens to be surprisingly precise and it makes me ponder why I had not looked at this in the same light before. Your article truly did switch the light on for me personally as far as this issue goes. However at this time there is just one issue I am not too cozy with so whilst I make an effort to reconcile that with the core idea of your position, allow me observe exactly what all the rest of your subscribers have to say. Very well done. Excellent! I would like to apprentice on your website? How could I subscribe for a weblog web site? The account would help me. This your article/blog provided bright transparent concept. Hi!, I really like your writing very much! Percentage we communicate extra approximately your article on AOL? I require a specialist on this space to solve my problem. May be that’s you! Having a look ahead to peer you. Hi, I’m really glad I’ve found this information. Today bloggers publish only about gossips and net and this is actually frustrating. This is a good website with interesting contents, that’s what I need. Thank you for keeping this website, I will be visiting it. Do you do newsletters? Can’t find it. Wow! This could be one of the most useful blogs we have ever run across on this subject. Basically Magnificent. I’m also an expert on this topic, therefore I can understand your effort. I’m just commenting to make you aware of of the perfect discovery my princess obtained by using your website. She has discovered a lot of things, most notably what it’s like to have an awesome helping mood to have others clearly know various complex subject areas. You actually exceeded my desires. Many thanks for displaying these helpful, healthy, explanatory and as well as cool tips about this topic to Kate. Hello, splendid job. I did not imagine this. This is a splendid story. Thanks! I admire your piece of work. Thanks for all the informative content. It’s the best time to make some plans for the future and it is time to be happy. I have read this post and if I may, I wish to recommend you for some interesting things or advice. Perhaps you could write next articles regarding this article. I desire to read more things approximately it! Pretty great post. I simply stumbled upon your weblog and wanted to mention that I have truly enjoyed surfing around your blog posts. In any case I will be subscribing on your feed and I hope you write again very soon! I loved what you have done in this article. The sketch is tasteful, your authored material stylish. Greetings I am so delighted I found your blog, I really found you by error, while I was searching on Bing for something else, Nonetheless I am here now and would just like to say thanks for a remarkable post and a all round exciting blog (I also love the theme/design), I don’t have time to go through it all at the minute but I have saved it and also included your RSS feeds, so when I have time I will be back to read much more, Please do keep up the fantastic job. There is noticeably a bunch to identify in this article. You made some very good points and I also liked the features. Woh, I enjoy your posts, saved to fav! . Everyone loves what you guys are up too. Such clever work and coverage! Keep up the great works guys I’ve incorporated you to my blogroll. I do not even know how I ended up here, but I thought this post was good. I don’t know who you are but certainly you are going to be a famous blogger if you aren’t already 😉 Cheers! Hello, I found your blog using MSN. This is an extremely well written article. I will be sure to bookmark it and return to read more of your useful info. Thanks for the post. I’ll certainly comeback. Do you mind if I quote a couple of your articles as long as I provide credit and sources back to your blog? My blog is in the exact same niche as yours and my users would definitely benefit from some of the information you provide here. Please let me know if this okay with you. Appreciate it! You really make it seem so easy with your presentation but I to find this matter to be actually something which I feel I might never understand. It kind of feels too complex and very vast for me. I look forward in your next publish, I will attempt to get the hang of it! Pretty great post. I just stumbled upon your weblog and wanted to mention that I have truly loved browsing your weblog posts. In any case I will be subscribing on your rss feed and I hope you write once more soon! I’m definitely impressed with your website. I had no trouble navigating through all the tabs and related info ended up being truly easy to do to access. I recently found what I hoped for before you know it at all. Quite unusual. A way for your client to communicate. Nice task. Woh, I like your articles, bookmarked!.. What i do not understood is in reality how you are now not actually a lot more neatly-preferred than you might be right now. You’re so intelligent. You understand thus significantly relating to this topic, made me in my view believe it from a lot of varied angles. Your individual stuffs nice. Always take care! Nice post. I be taught something more challenging on completely different blogs everyday. It is going to always be stimulating to learn content material from other writers and follow a bit of one thing from their store. I’d prefer to make use of some with the content on my blog whether you don’t mind. Natually I’ll provide you with a link on your web blog. Thanks for sharing. I have to convey my respect for your kind-heartedness in support of folks that actually need assistance with that field. Your real commitment to passing the solution around appeared to be certainly powerful and has frequently made some individuals like me to arrive at their desired goals. Your amazing useful information entails so much to me and much more to my office workers. Thanks a ton; from all of us. Its excellent as your other articles: Thank you for putting up. “It takes less time to do things right than to explain why you did it wrong.” by Henry Wadsworth Longfellow. You’re so cool! I don’t suppose I’ve learn anything like this before. So good to search out any person with some unique thoughts on this subject. Really would like to thank you. This website is something that is needed on the web, and someone with a little originality. Nice job of bringing one thing new to the internet! Hey, I found this blog for the first time. I find this article truly helpful and it has really helped me out. I’m hoping to provide this aid to others much like you have aided me. Good info… Lucky for me that I found this website by accident, I have now bookmarked it. I want to show my affection for your generosity giving support to individuals that really need help on in this subject. Your personal dedication to getting the message up appears to be definitely beneficial and has consistently permitted girls just like me to realize their ambitions. The useful information signifies a lot to me and somewhat more to my colleagues. Thank you; from everyone of us. Keep up the great work, I have read few posts on this website and I believe this blog is rattling interesting and holds circles of superb information. I believe this website contains some wonderful info for everyone :D. “Calamity is the test of integrity.” by Samuel Richardson. I have learn a few just right stuff here. Definitely value bookmarking for revisiting. I’m surprise how you set out to make this one of these fantastic informative website. It is excellent like many of your other blog posts: D, thanks for posting. I’ve been browsing online more than three hours, but I never found any interesting article like this. It’s lovely value sufficient for me. In my view, if all site owners and bloggers made excellent content material as you have, the web would be a lot more useful. Thanks for another excellent post. Where else can a person go to get information like and with such an ideal method of writing? I have a presentation next week, and I am on the search for such information. I’ve been surfing online for more than 3 days, but I by no means found any fascinating article like this one. It is beautiful piece for me. In my view, if all site owners and bloggers made good content as you have, the net would be much more useful than ever before. I like this post, enjoyed this one thanks for posting it. “Money is a poor man’s credit card.” by Herbert Marshall McLuhan. There is noticeably a bundle to know about this. You made some really nice points. Would love to perpetually get updated, as this is an outstanding site!. I like the helpful info you supply in your articles. I will bookmark your weblog and take a regular look at again it. I’m fairly sure I will learn lots of new stuff! Best of luck for the following! Nice post. I learn something more challenging on different blogs everyday. It will always be stimulating to read content from other writers and practice a little something from their store. I’d prefer to use some of this content on my blog, if you don’t mind. Naturally I’ll will link to your web blog. Thanks for sharing. You are my inspiration, I possess few web logs and sometimes run out from to brand : (. As I web-site possessor I believe the content matter here is rattling wonderful, appreciate it for your efforts. You should keep it up forever! Best of luck. You have mentioned very interesting details! ps: nice website. “Hares can gamble over the body of a dead lion.” by Publilius Syrus. Really excellent information can be found on this website. I’ve recently started a site, the info you provide on this web site has helped me greatly. Thanks for all of your time and work. Hey very nice web site!! Man .. Beautiful .. Amazing .. I will bookmark your website and take the feeds also… I am happy to find so many useful information here in the post, we need work out more strategies in this regard, thanks for sharing. . . . . .
It’s a perfect time to make plans for the future and it is time to be happy. I have read this post and if I could I want to suggest you few interesting things or suggestions. Maybe you can write next articles referring to this article. I wish to read more things about it! Hey, I just wanted to give you a quick heads up! Very good blog! Thank you for another fantastic post. Where else could anybody get that type of information in such a perfect method of writing? I’ve a presentation next week, and I was search for this kind of information. Please let me know if you’re looking for a article writer for your weblog. You have some really great articles and I think I would be a good asset. If you ever want to take some of the load off, I’d really like to write some content for your blog in exchange for a link back to mine. Please send me an email if interested. Thank you! I genuinely enjoy looking at on this internet site, it contains good posts. Thank you, I have just been looking for information approximately this topic for ages and yours is the greatest I have came upon so far. I think other website owners should take this internet site as an example, very clean and good user design. I would like to thank you for the efforts you have put in writing this blog. In fact your creative writing abilities has inspired me to get my own blog now. Really the blogging is spreading its wings quickly. Your write up is a good example of it. I have been absent for a while, but now I remember why I used to love this blog. Thanks, I’ll try and check back more often. I like the valuable information you supply on your articles. I will bookmark your blog and take a look at once more right here regularly. I am reasonably certain I will learn lots of new stuff proper right here! Best of luck for the next! This web site is my aspiration, real excellent layout and perfect subject matter. I discovered your weblog website on google and test a couple of of your early posts. Proceed to keep up the superb operate. I just additional up your RSS feed to my MSN News Reader. That is very fascinating, You are an excessively professional blogger. I’ve joined your rss feed and look forward to in the hunt for more of your great post. Also, I’ve shared your website in my social networks! This website is my inspiration, really great style and design and perfect content material. I was always concerned about this subject, thank you. Hello, I read your blog occasionally and own a similar one and was just wondering if you get a lot of spam responses? If so how do you stop it, any plugin or anything you can recommend? I get so much lately it’s driving me mad so any assistance is very much appreciated. Excellent website, there is a lot of helpful information here. I’m sharing it with. And certainly, thanks for your sweat! There are some very good tips especially to those new to the blog-us-sphere of accurate information… Thanks for sharing this one. A must read article. I’m really enjoying the theme/design of your site. Do you ever run into any internet browser compatibility issues? A small number of my blog readers have complained about my site not working correctly in Explorer but looks great in Safari. Do you have any ideas to help fix this issue? Greetings! I’ve been following your website for a while now and finally got the bravery to go ahead and give you a shout out from Humble Texas! Just wanted to mention keep up the good work! Write more, thats all I have to say. You clearly know what you’re talking about. Thank you for another wonderful post. Where else could anyone get that kind of info and such an ideal way of writing? I’ve got a presentation next week, and I am on the look for this kind of information. Amazing, as I really enjoy your article’s. Thanks a lot!!! Utterly outstanding subject material, thanks for the information. “He who establishes his argument by noise and command shows that his reason is weak.” by Michel de Montaigne. Helpful info!!! Fortunate for me I discovered this website by accident, and I’m surprised why this twist of fate did not take place in earlier! I have now bookmarked it. I’ve been absent for sometime, but now I remember why I used to love this website. Thanks, I’ll try and check back more frequently. Great and impressive website. I had no trouble navigating through all the tabs and related info ended up being truly simple to do to access. I recently found what I hoped for. Reasonably unusual. I’m sure many will appreciate this website specially those who have forums or any kind of website theme. There are tons of ways for your customer to communicate. Excellent task..
Wow! In the end this is a website from where I will be able to obtain really useful information for my study’s and knowledge. It’s really a cool and useful piece of info. I am happy that you just shared this helpful information with us. Thank you for sharing. hello there and thank you for your info – I have definitely picked up something new. Very interesting info! Perfect just what I was searching for! “Music is a higher revelation than philosophy.” by Ludwig van Beethoven. As I website possessor, I like the content here and it is very wonderful, thanks for your efforts. I would like to say thinks for the efforts you have put in writing this blog. In fact, your creative writing abilities has inspired me to get my own blog now. Really the blogging is spreading its wings quickly. Your write up is a good example of this. This is a really great posts, really appreciate this contribution. Thank you for sharing this excellent information. Your website is so cool. I am impressed by the details that you have on this website. It reveals how nicely you understand this subject. Bookmarked this website page, will come back for more articles. You, my pal, ROCK! I simply found the information, which I have searched other places to be excellent. What a perfect website. I keep listening to the news lecture about getting boundless online grant applications so I have been looking around for the best site to get one. Could someone advise me please, where I might find some? I have been browsing on-line for over 3 hours, yet I never found any fascinating article like yours. It is beautiful value sufficient for me. In my view, if all website owners and bloggers made good content material as you have, the web would be a lot more useful. yourself and clear your thoughts prior to writing. I’ve had a tough time clearing my thoughts in getting my thoughts out. I do enjoy writing however it just seems like the first 10 to 15 minutes are generally lost just trying to figure out how to begin. Any recommendations or hints? Appreciate it! Just want to say your article is astounding. The clearness in your post is simply great and I could assume you’re an expert on this subject. Fine with your permission allow me to grab your feed to keep up to date with forthcoming post. Thanks a million and please continue the rewarding work. I beloved up to you will receive performed right here. The sketch is tasteful, your authored subject matter stylish. nonetheless, you command get bought an edginess over that you wish be delivering the following. in poor health undoubtedly come further beforehand again as exactly the similar just about very steadily within case you defend this hike. Very interesting details in this article. Thanks for posting. Hello! I just would like to give a huge thumbs up for the great info you have in this post. I will be coming back to your blog for more soon. After an MRI, I was diagnosed of MULTIPLE SCLEROSIS. After years on medications, symptoms worsened with tremors on my right hand, numbness and tingling, muscle weakness and loss of speech. Fortunately last year, I learned about HERBS and their Multiple Sclerosis alternative treatment. The Multiple Sclerosis herb treatment made a great difference, most of my symptoms including tremors, weakness and others gradually disappeared. I have improved greatly over the 6 months period of treatment and it been a years since the treatment, with no symptoms. I have a very good quality of life and a supportive family! me a acceptable amount. I was acquainted about your website, which offered bright clear content. Hi there, all is going well here and of course every one is sharing information, that’s actually excellent, keep up writing. Oh my goodness! Incredible article dude! Thank you However I am having problems with your RSS and don’t know why I cannot join it. Is there anybody else having this problem RSS problem and might know the solution??? Would you kindly respond? Thanx!!! Thank to my father who sent this post to me, this website is in fact remarkable. An impressive post! I forwarded this to a co-worker who has been doing homework on this subject. And he in fact bought me lunch due to the fact that I discovered it for him… lol. So allow me to reword this…. Thank YOU for the meal!! But yeah, thanks for spending some time to discuss this topic here on your web page. I’m gone to tell my little brother, that he should also visit this blog on a regular basis. Naturally liked your website, and will definitely come back again. Excellent post. I just read this blog and I am impressed! Extremely useful information particularly the last part 🙂 I really care for this kind of information. I have been looking for this particular information for a long time. Thank you and good luck. Thank you, I have been looking for info on this subject for a long time and yours is the best I have found so far. You are my intake, I own few web logs. An impressive share, I just give this to a colleague who was doing a little analysis on this. And he in fact bought me breakfast because I found it for him…smile. So let me reword that: Thanks for the treat! But yeah, thanks for spending the time to discuss this, I feel strongly about it and love reading more on this topic. Big thumb up for this blog post! I found some really interesting info on your website, so I have bookmarked it. Some really nice and utilitarian information on this website, also I feel the design has superb features. Glad to be one of several visitors on this website. D.
Hello, This article was extremely interesting, especially since I was browsing for thoughts on this subject over the past couple of days. Hi my family members and I want to say that this post is awesome, great written and include approximately all vital info. I’d like to peer extra posts like this. Useful information. Fortunate for me I discovered your site by accident, and I am surprised why this coincidence did not happened in advance! I have now bookmarked it. I pay a visit every day to some web pages and blogs to read content, but this web site provides quality based writing. VISIT BIBLEFREEDOM TO SEE PROOF FOR THESE THINGS AND MUCH MORE! TELL YOUR FRIENDS AND FAMILY. SHARE THIS MESSAGE! Hi my family members and I would like to say that this post is amazing, nicely written and come with approximately all significant info. I would like to see more posts like this. I am going to do my breakfast, and afterward having my breakfast, come back to read additional news. It’s an awesome post for all the internet people. I’m sure they will get advantage from it. It is the best time to make some plans for the future and it is time to be happy. I’ve read this post and if I could I desire to suggest you few interesting things or suggestions. I am in fact delighted to glance at this blog posts which contains tons of helpful data, thanks for providing these data. Wow, wonderful blog structure! How long have you ever been running a blog for? You make running a blog look easy. The overall glance of your web site is fantastic, let alone the content material! Remarkable things here. I am very glad to look your post. Thank you a lot. Good day! I could have sworn I’ve visited this website before but after looking at a few of the posts I realized it’s new to me. Nonetheless, I’m definitely pleased I came across it and I’ll be book-marking it and checking back frequently! It’s an amazing piece of writing designed for all the online people; they will benefit from it I feel sure. Very good blog! Do you have any suggestions for aspiring writers? I’m planning to start my own website soon but I’m a little lost on everything. You’re so cool! I don’t suppose I’ve read anything like this before. So nice to find somebody with some original thoughts on this subject. Really want to thank you for starting this up. This website is something that is needed on the web, someone with a little originality. Useful job for bringing something new to the internet! Thanks for your marvelous posting! I definitely enjoyed reading it, you might be a great author. I will make sure to bookmark your blog and definitely will come back sometime soon. I want to encourage you to continue your great posts, have a nice day! I’m still learning from you, but I’m trying to reach my goals. I absolutely liked reading everything that is written on your blog. Keep the stories coming. I loved it! Hi it’s me, I am also visiting this site daily, this site is truly fastidious and the visitors are actually sharing pleasant thoughts. I am truly thankful to the holder of this website who has shared this wonderful post. Having read this I thought it was really enlightening. I appreciate you spending some time and effort to put this information together. I once again find myself spending way too much time both reading and posting comments. But so what, it was still worthwhile! Aw, this was an extremely good post. Finding the time and actual effort to produce a superb article… but what can I say… I put things off a lot and don’t seem to get anything done. One thing I’d really like to say is the fact before acquiring more computer system memory, look at the machine within which it is installed. Should the machine is actually running Windows XP, for instance, the actual memory threshold is 3.25GB. Putting in over this would purely constitute just a waste. Make certain that one’s mother board can handle your upgrade amount, as well. Thanks for your blog post. Visit BIBLEFREEDOM to see proof for these things and much more! Simply want to say your article is as amazing. The clarity in your post is just nice and I can assume you are an expert on this subject. Well with your permission let me to grab your RSS feed to keep updated with forthcoming post. Thanks a million and please carry on the gratifying work. I must voice my enthusiasm for the kindness in support of individuals that actually need guidance on this one problem. Your personal dedication to obtaining the solution along became extremely invaluable and has continuously made associates similar to me to arrive at their ambitions. The helpful help and advice means so much a person like me and specifically to my mates. Thank you; from everyone of us. Howdy! Do you know if they make a plugins to protect against hackers? I’m kinda paranoid about losing everything I’ve worked hard on. Any suggestions? A motivating discussion is worth comment. I do believe that you should publish more on this issue, it may not be a taboo subject but usually people don’t discuss such issues. To the next! Cheers!! Hi there, just became alert to your blog through Google, and found that it’s truly informative. I’m gonna watch out for brussels. I will be grateful if you continue this in future. Numerous people will be benefited from your writing. Asking questions are actually nice thing if you don’t understanding anything totally. However this article offers good understanding. This post is in fact a nice one it assists new internet viewers, who are wishing in favor of blogging.